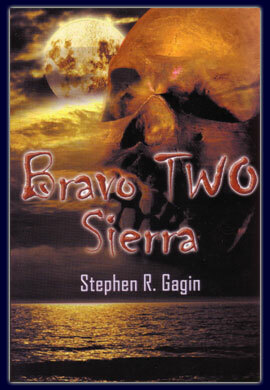 Bravo Two Sierra is quite the change of pace from the usual pirate book. The story is completely modern and – like most modern piracy – it completely lacks the romantic panache that makes historical piracy so much fun. But that’s not to say this book isn’t entertaining. Indeed, more than anything I enjoyed the language. It reminded me of reading Treasure Island, except instead of words like “belay” and “scupper,” author Stephen R. Gagin has inundated his work with modern nautical terminology. Phrases such as “1MC” and “sea and anchor detail” abound, phrases frighteningly familiar from my navy days. Indeed, it was Gagin’s persistence in sharing the details of modern shipboard life that made this book most worthwhile. Gagin goes to great lengths to develop the temperaments and motivations of the crewman of the USS Massasoit – the ill fated naval ship destined for a run-in with modern pirates – delving into the minds of enlisted and officer alike. And he doesn’t stop there, but goes on to pursue the inner workings and life-stories of a multitude of other characters, ranging from CIA operatives to Cuban police chiefs, and from prostitutes to satanic cult leaders. Many of these background stories are quite interesting, although all together they do take on a “cast of thousands” feel, and it can get difficult at times to keep track of who’s who. The vast majority of Bravo Two Sierra was an intriguing and enjoyable read. It did suffer from more than its fair share of typos, which proved somewhat distracting at times (and other times quite amusing, as in a brief reference to the famous historical pirate, Captain “Harry Morgan”), but this doesn’t make this book any less valuable to anyone wishing for a fictitious peek into the life of the modern sailor. However, what might detract from some readers’ enjoyment is the latter portions of the book. While I don’t wish to give away any specifics of the story, it bears mention that the modern pirates in this book are brutal. The bloodshed builds as the book draws into its final chapters, and it isn’t pretty. Gagin pulls no punches in showing just how evil his antagonists can be, and takes the violence to a level that’s borderline sadistic. Some readers may find this exciting, but others will surely find it off-putting. All told, I find myself in the unique position of being unable to recommend this book, but I wouldn’t NOT recommend it, either. Part Tom Clancey and part Stephen King, I found this book in parts to be gripping and enjoyable, yet in others it was downright savage. And so I think it best to just step back this time and let readers decide for themselves whether this sounds like a book for them or not – some of you should steer clear, while others may wish to pick up a copy right away. You’ll have to decide for yourself into which category you fall. This entry was posted in Books and tagged fiction, gagin, modern pirates, navy by Bilgemunky. Bookmark the permalink.